Travis County officials want to stop what they call an illegal subdivision near Leander. TRAVIS COUNTY, Texas — Travis County officials want to stop what they call an illegal subdivision. Stopping the development, called Chaparral Woods, could displace the families who live there, according to Commissioner Gerald Daugherty. “The defendants in this case deceived multiple families into paying over $850,000 for something that doesn’t exist – a unit in an imaginary condominium,” the court petition showed. The declaration filed with the Travis County Clerk shows Chaparral Woods is made up of two 10-acre sections. Each section will hold “units” each. What’s listed as a “condo” is the land only. “At every step of the way, the defendants have lied. They lied in their publicly filed condominium declaration. They lied to potential purchasers by claiming (1) that they had created a condominium and (2) that they had the right to sell subdivided portions of real property,” the court petition showed. 13 Tex. Prop. Code § 12.002(f). 14 Tex. Prop. Code § 82.152(a). 15 Tex. Prop. Code § 82.153(a)(4). 16 Tex. Prop. Code § 82.153(c). 17 Tex. Prop. Code § 82.152(d). 18 Tex. Bus. & Comm. Code § 27.01. 19 Tex. Bus. & Comm. Code § 27.015. Travis County v.
Manager Alan J. Shield disagrees. “We are working with our homeowners and the proper Travis County departments to correct the permitting issue,” said Shield in a statement to KVUE. The KVUE Defenders investigated this property last summer. KVUE reported how some families moved trailers on their “condo lots” before water lines and a sewage system were in place. Shield says the families now have running water and a temporary disposal system in place, which gets pumped out regularly. Neighbors aren’t on board with the project. They started complaining to the county a year ago. “The legal process is not something you do in a matter of few weeks; it takes a long time to ‘paper up,’” says Daugherty. Rob Faccone says last summer the developer cut trees on his property. The divided land was sold ranging from $45,000 to $117,000 per lot. The Deeds of Trust show the developer took a loan for $330,000 to buy the 20 acres. So Chaparral Woods LLC could make as much as $612,110 if it provided no infrastructure and sold no additional lots. But most infrastructure is in place and Shield says the business has not made any profit. “We want to be clear that we have not made any money on the project and we will continue to correct and complete the project to Travis County Specs. Our ultimate goal is to provide affordable and safe home sites for families in Travis County,” says Shield. As the lawsuit progresses, Commissioner Daugherty says the people living there may be impacted the most. “I don’t think the people who live here have a lot of options… if you have to move your trailer home, where do you have to go?” Daugherty says. 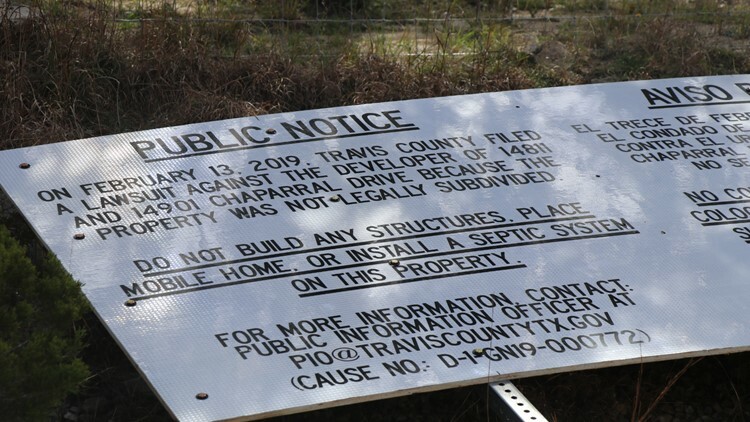 This sign was posted Monday, February 25, 2019 notifying the public about a Travis County lawsuit. The suit accuses the developer of violating county development codes as well as conducting fraudulent practices. The defendant denies all allegations. What will be debated in court is the definition of a “condominium.” Shield says the land is the real property condo unit. He describes the driveways as “hallways” to the condo unit. He says it gives better privacy and curb appeal. He also points to other developers who use condo regulations to build neighborhoods. KVUE is digging on how these rules and regulations work, and how they impact home buyers as we continue our Boomtown 2040 coverage.